What do sensitivity values tell you? The sensitivity of a test is also called the true positive rate (TPR) and is the proportion of samples that are genuinely positive that give a positive result using the test in question. For example, a test that correctly identifies all positive samples in a panel is very sensitive. Another test that only detects 60 % of the positive samples in the panel would be deemed to have lower sensitivity as it is missing positives and giving higher a false negative rate (FNR). Also referred to as type II errors, false negatives are the failure to reject a false null hypothesis (the null hypothesis being that the sample is negative). What do specificity measures tell you? The specificity of a test, also referred to as the true negative rate (TNR), is the proportion of samples that test negative using the test in question that are genuinely negative. 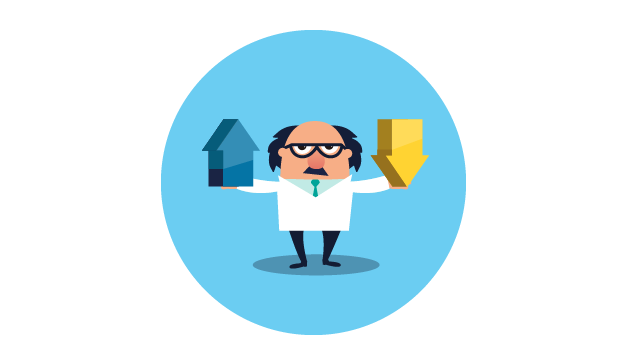 For example, a test that identifies all healthy people as being negative for a particular illness is very specific. Another test that incorrectly identifies 30 % of healthy people as having the condition would be deemed to be less specific, having a higher false positive rate (FPR). Also referred to as type I errors, false positives are the rejection of a true null hypothesis (the null hypothesis being that the sample is negative). SnNouts and SpPins is a mnemonic to help you remember the difference between sensitivity and specificity. SnNout: A test with a high sensitivity value (Sn) that, when negative (N), helps to rule out a disease (out). SpPin: A test with a high specificity value (Sp) that, when positive (P) helps to rule in a disease (in). How do I calculate sensitivity and specificity values? An ideal test rarely overlooks the thing you are looking for (i.e., it is sensitive) and rarely mistakes it for something else (i.e. it is specific). Therefore, when evaluating diagnostic tests, it is important to calculate the sensitivity and specificity for that test to determine its effectiveness. The sensitivity of a diagnostic test is expressed as the probability (as a percentage) that a sample tests positive given that the patient has the disease. The specificity of a test is expressed as the probability (as a percentage) that a test returns a negative result given that the that patient does not have the disease. You have a new diagnostic test that you want to evaluate. You have a panel of validation samples where you know for certain whether they are definitely from diseased or healthy individuals for the condition you are testing for. Your sample panel consists of 150 positives and 400 negatives. 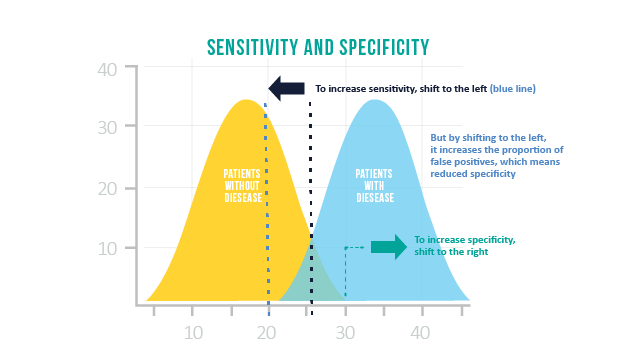 Are sensitivity and specificity the same as the positive predictive value (PPV) and negative predictive value (NPV)? In short, no, although they are related. The positive predictive value (PPV) is the probability that a subject/sample that returns a positive result really is positive. The negative predictive value (NPV) is the probability that a subject/sample that returns a negative result really is negative. This sort of information can be very useful for discussing results with a patient for example, evaluating the reliability of any test they may have had. The same values used to calculate the sensitivity and specificity are also used to calculate the positive and negative predictive values. One way to look at it is that the sensitivity and specificity evaluate the test, whereas the PPV and NPV evaluate the results. So, if a test result is positive, there is a 92 % chance it is correct, if it is negative there is a 98 % chance it is correct. The complementary value to the PPV is the false discovery rate (FDR), the complementary value of the NPV is the false omission rate (FOR) and equates to 1 minus the PPV or NPV respectively. The FDR is the proportion of results or “discoveries” that are false. The FOR is the proportion of false negatives which are incorrectly rejected. Essentially, the higher the PPV and NPV are, the lower the FDR and FOR will be - which is good news for the reliability of your test results. How should I balance sensitivity with specificity? Where results are given on a sliding scale of values, rather than a definitive positive or negative, sensitivity and specificity values are especially important. They allow you to determine where to draw cut-offs for calling a result positive or negative, or maybe even suggest a grey area where a retest would be recommended. For example, by putting the cutoff for a positive result at a very low level (purple dashed line), you may capture all positive samples, and so the test is very sensitive. However, this may mean many samples that are actually negative could be regarded as positive, and so the test would be deemed to have poor specificity. 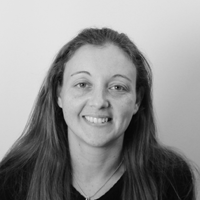 Finding a balance is therefore vital for an effective and usable test. Using a receiver operating characteristic (ROC) curve can help to hit that sweet spot and balance false negatives with false positives. However, the context is also important as to whether false negatives are less problematic than false positives, or vice versa. For example, if it is imperative that all positives are identified – for example, in a matter of life and death, then you may be willing to tolerate a higher number of false positives to avoid missing any. Here, false positives can be screened out further down the line. A ROC curve is a graphical representation showing how the sensitivity and specificity of a test vary in relation to one another. 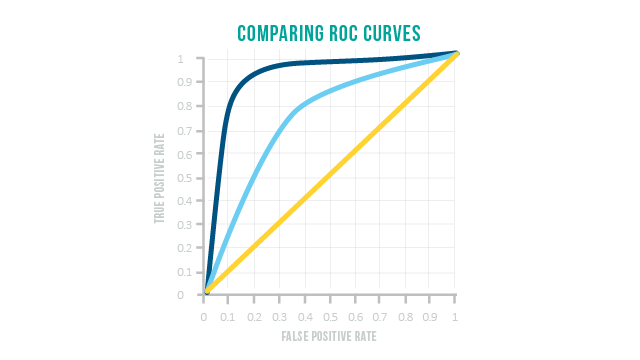 To construct a ROC curve, samples known to be positive or negative are measured using the test. The TPR (sensitivity) is plotted against the FPR (1 - specificity) for given cut-off values to give a plot similar to the one below. Ideally a point around the shoulder of the curve is picked which both limits false positives whilst maximizing true positives. A test that gave a ROC curve such as the yellow line would be no better than random guessing, pale blue is good, but a test represented by the dark blue line would be excellent. It would make cutoff determination relatively simple and yield a high true positive rate at very low false positives rate – sensitive and specific.